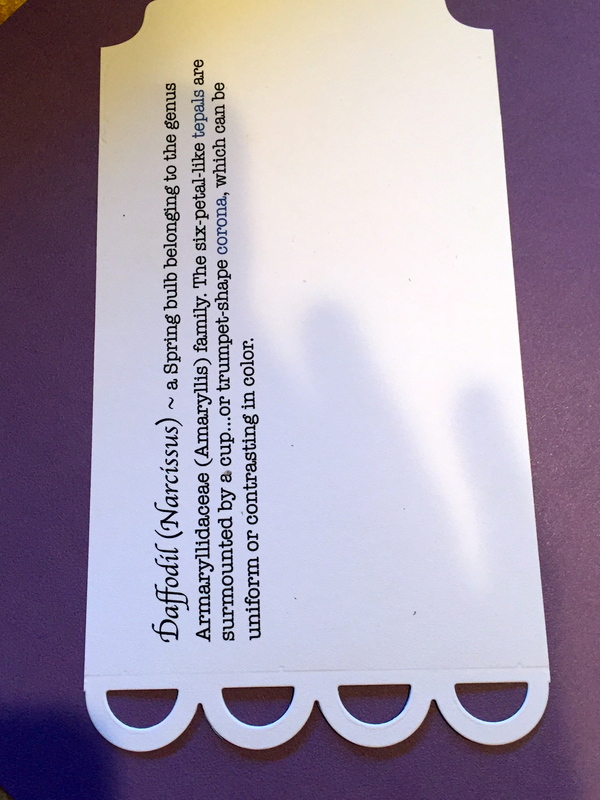 I printed, on Soft Finish 100lb white card stock, on my computer a description of the daffodil. 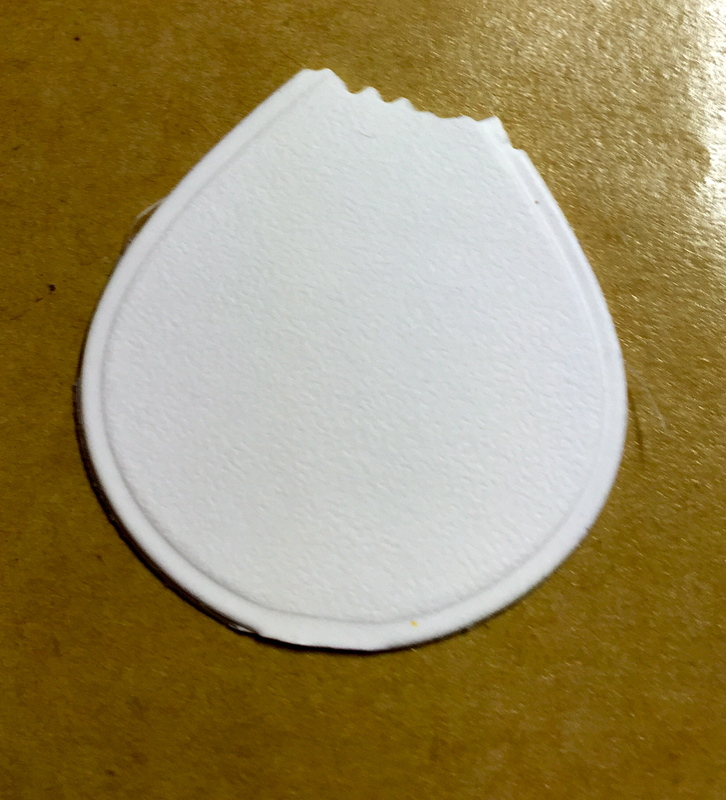 I used Els van de Burgt Studio “Tags & More 7″ to die cut the shape of the tag. (Any of her tag designs would be great, but make sure it’s width is at least 4 1/4”). I also die cut her Ornament Set 4 solid ornament twice with Clear Double Sided Adhesive on the back and Garden Notes/Daffodil stem and leaves in the same paper. 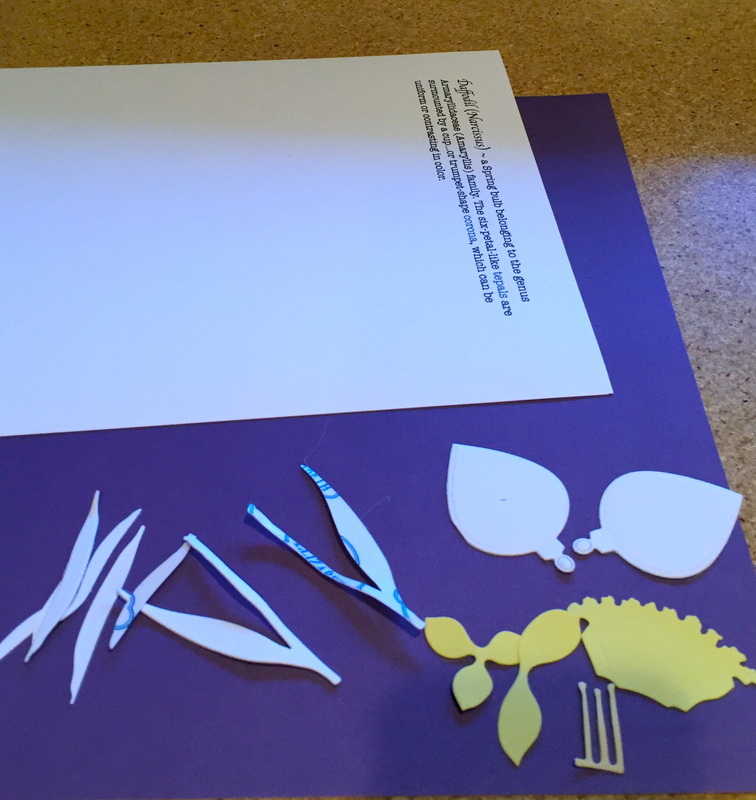 The corona and petals were die cut in Premium Palette/Golden Yellow card stock. I trimmed the “hook” from the ornament and used deckle scissors on the top of the bulb. I put the leaves and stem together, then colored them with Copic Markers G99, YG93, YG95. I left a little white area at the bottom of the stem for a natural look. 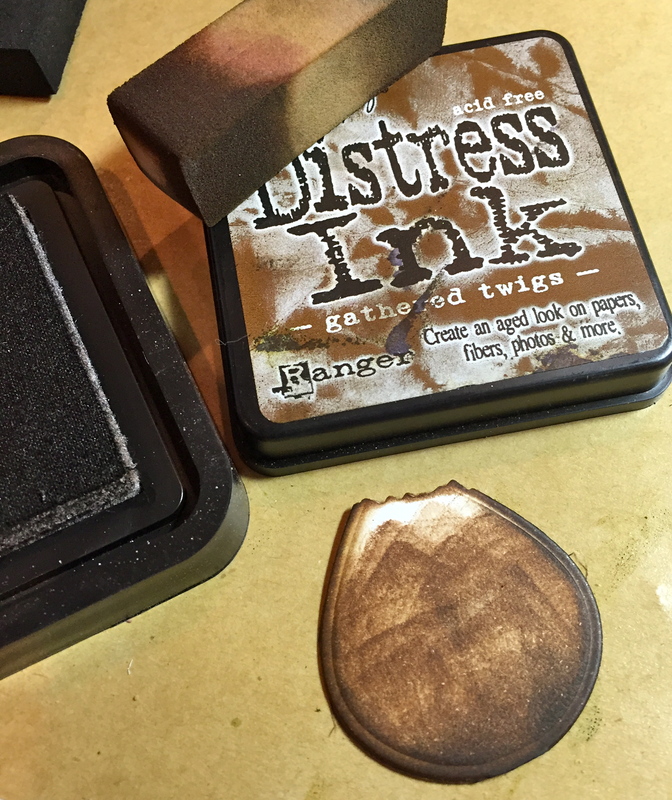 I shaded the “bulb” with Distress Inks/Gathered Twig and Walnut Stain. 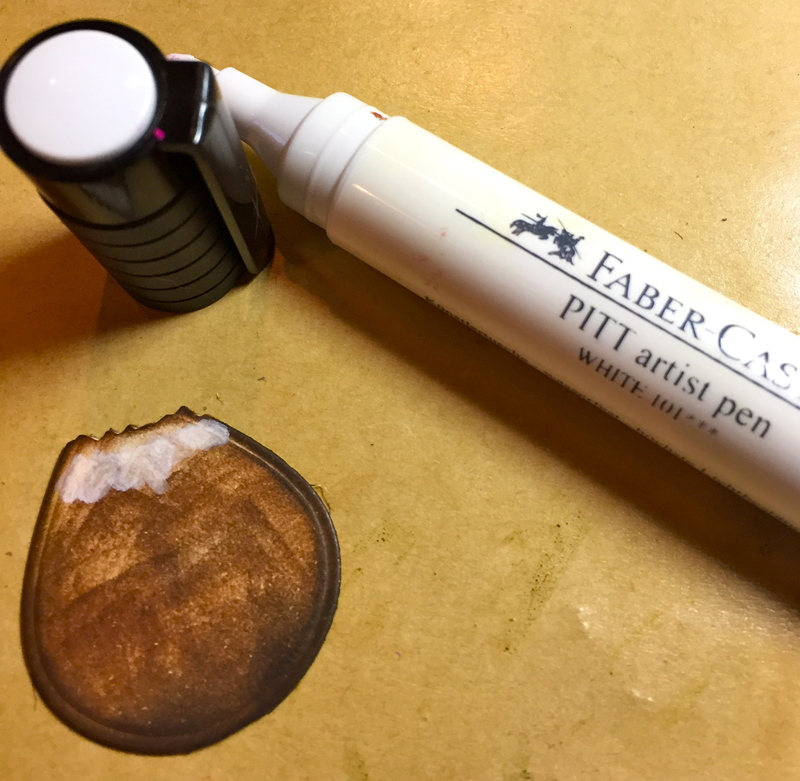 I used Faber Castell’s White Ink Pen to shade the top of the bulb. 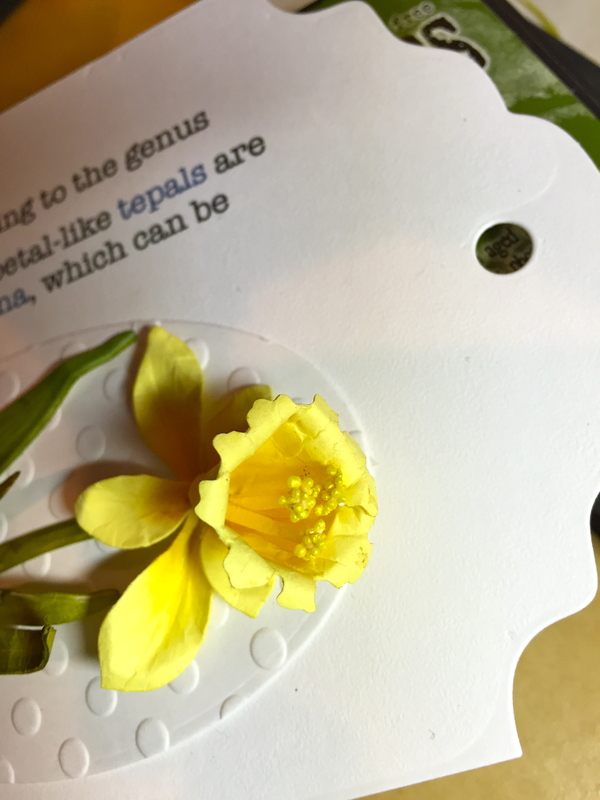 Build the Daffodil right onto the tag–first add the stem. 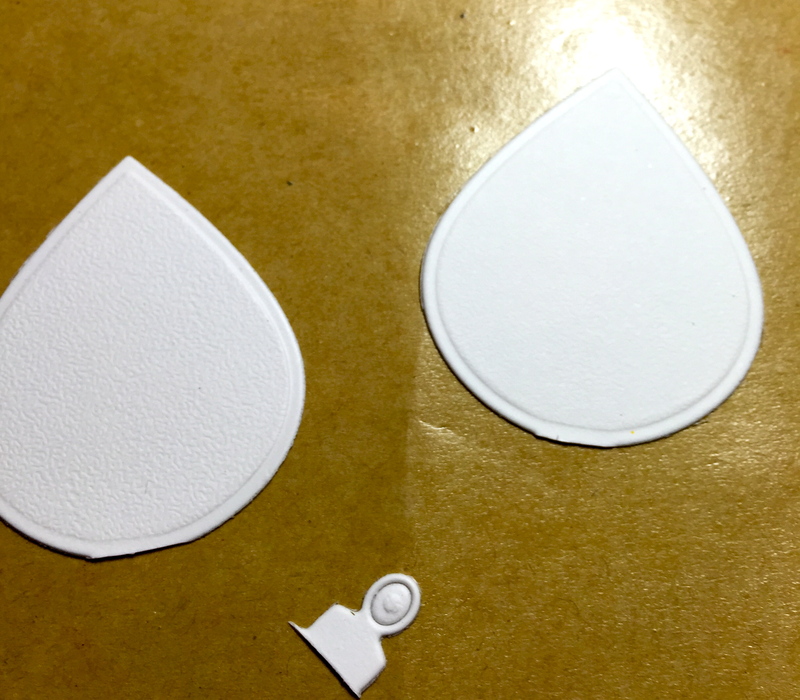 If you’ve used Clear Double Sided Adhesive, this is easy! 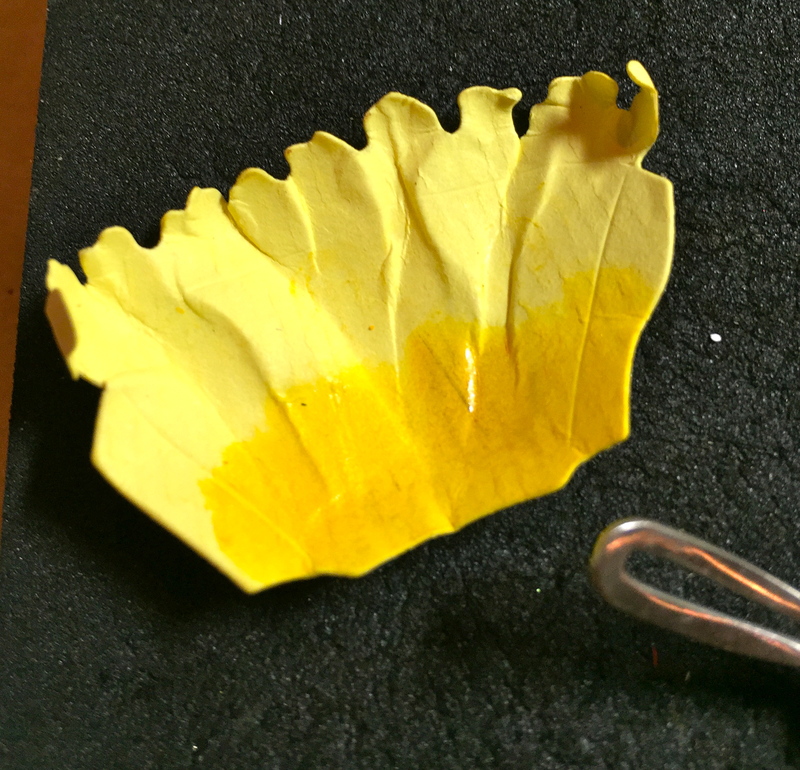 Shade the corona and petals with PanPastels Set 1/Diarylide Yellow. 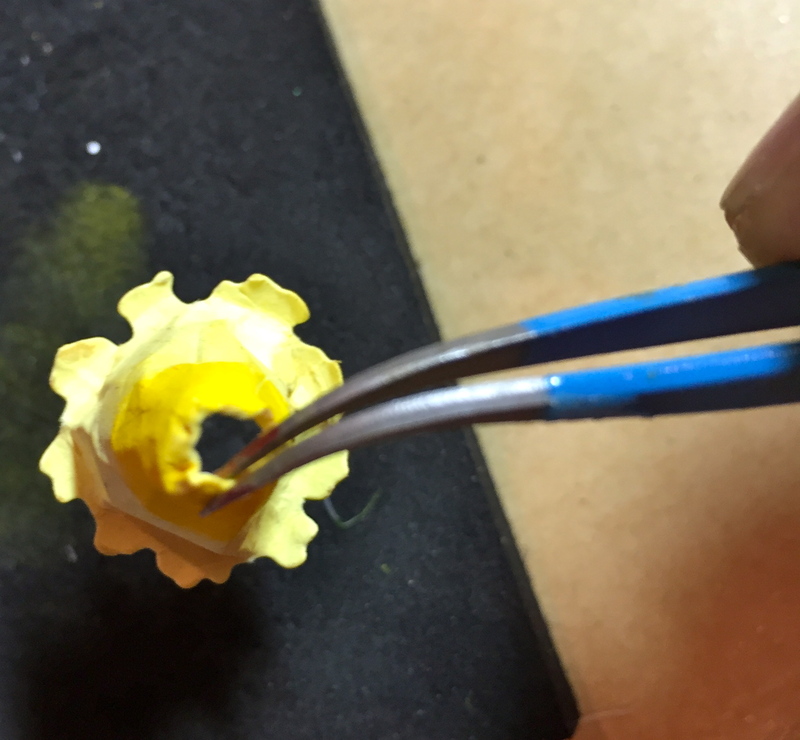 Place the corona on the Molding Pad and use the Loop Tool to shape it, first with the right-side-up, then flip it over and shape the wrong side. Use the tweezers to bend the “flaps” in, then use a toothpick to apply a small amount of glue to one of the flaps and bring them together. Use your Reverse Tweezers from my Tool Kit to hold this a second until set. Use the tweezers to bend down the top edge. 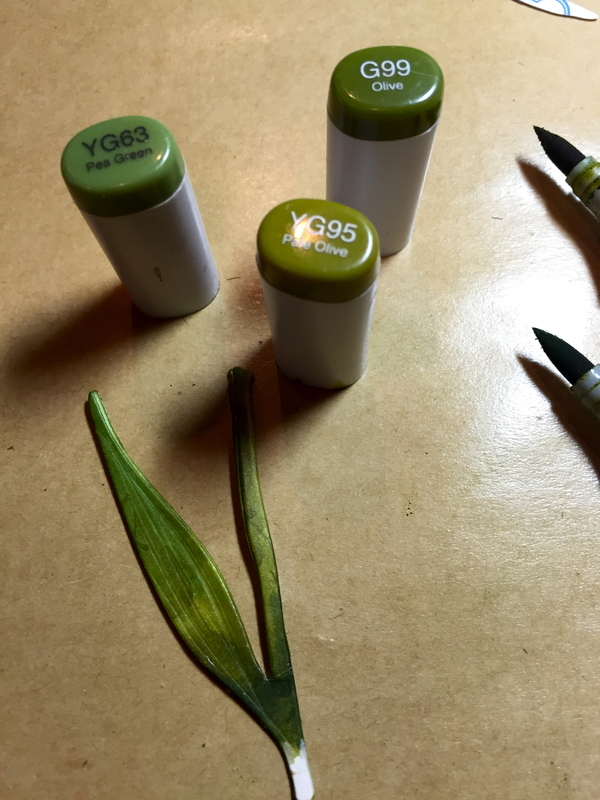 Finally, use ECD’s small tweezers to bend in on the bottom edge. This gives a nice finish to the corona. 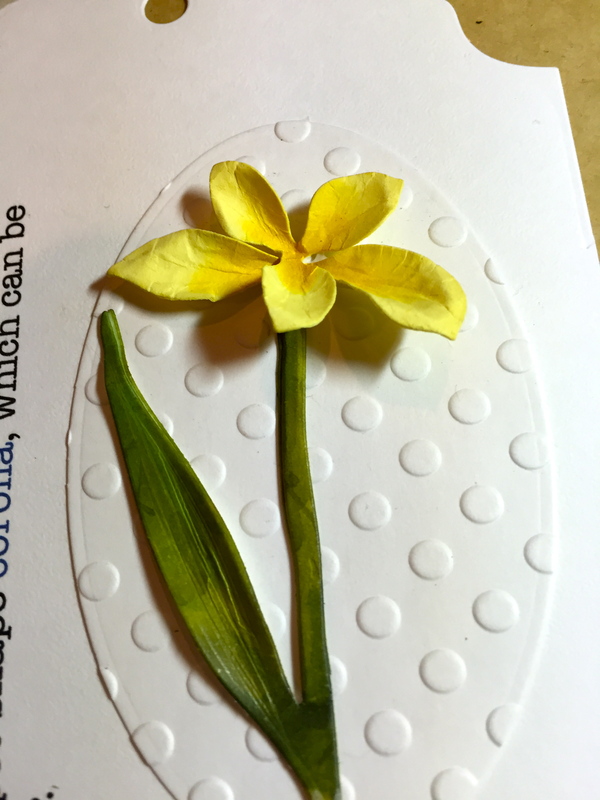 Shape the petals on the Molding Pad and then use the tweezers to pinch and bend each one. 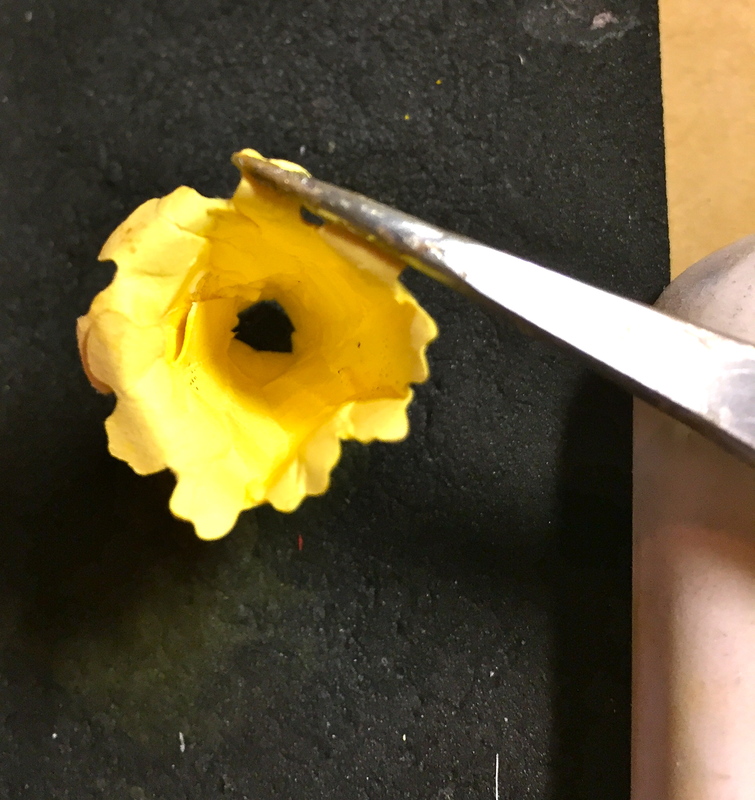 Place the pieces back on the Molding Pad and use the small ball stylus to cup the center of both petal sections. 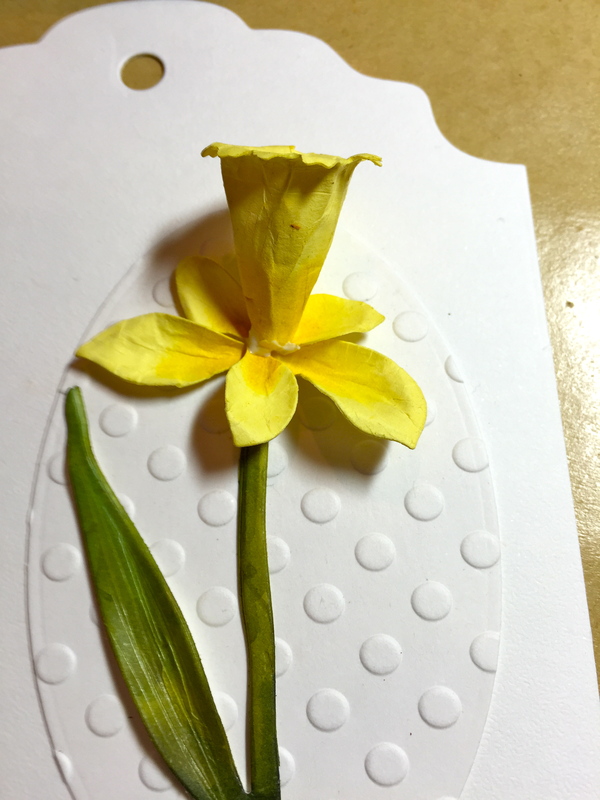 Use a toothpick to apply a small amount of glue on the bottom of the two-petal piece and set in place. Repeat with the three-petal piece. 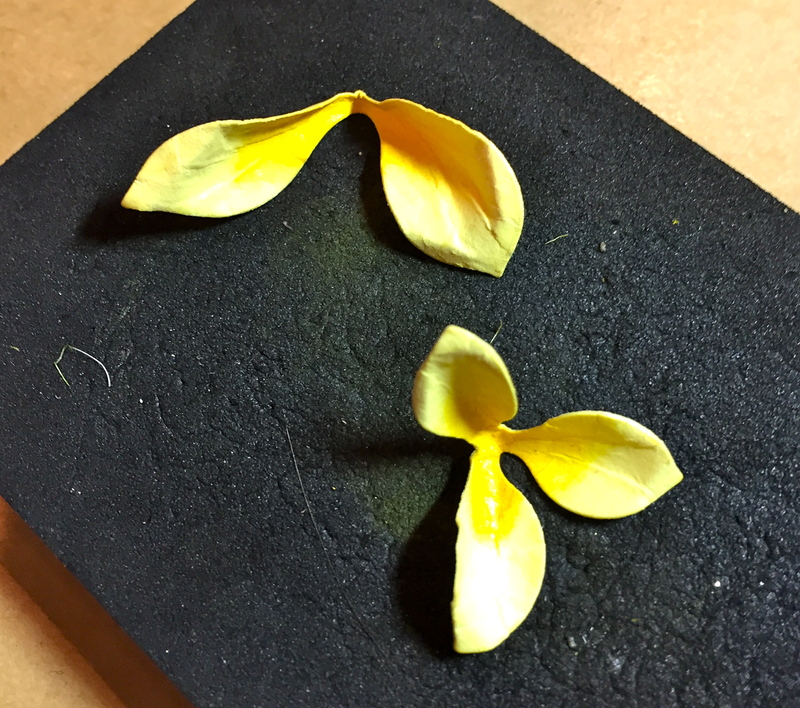 Dip the corona into the glue and set in place on top of the petals. 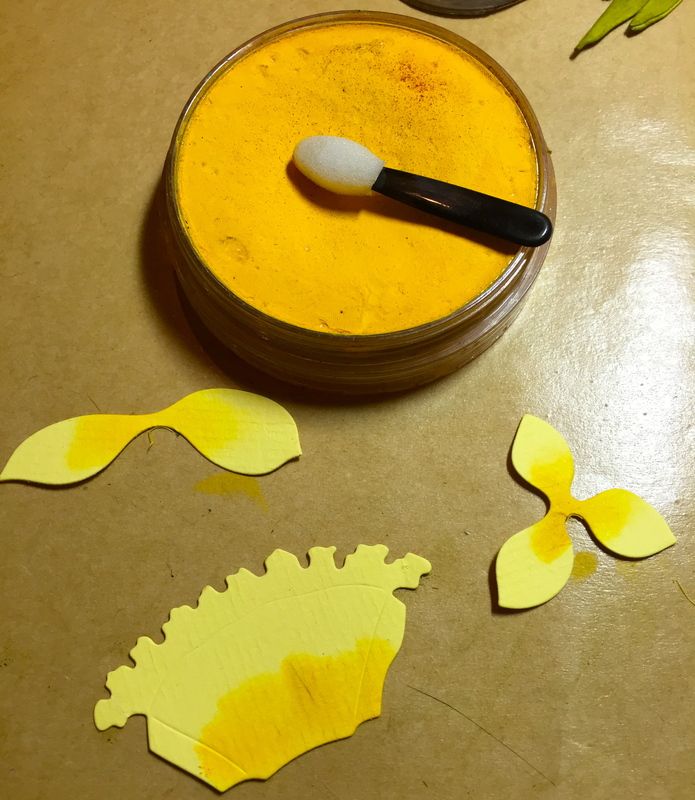 The final step for the flower is to roll the Stamen die cut piece, use a toothpick to apply glue and secure. Fan out the filaments, and lightly dip the ends into glue, then Prills/You Had Me At Yellow. Set in place inside the corona. 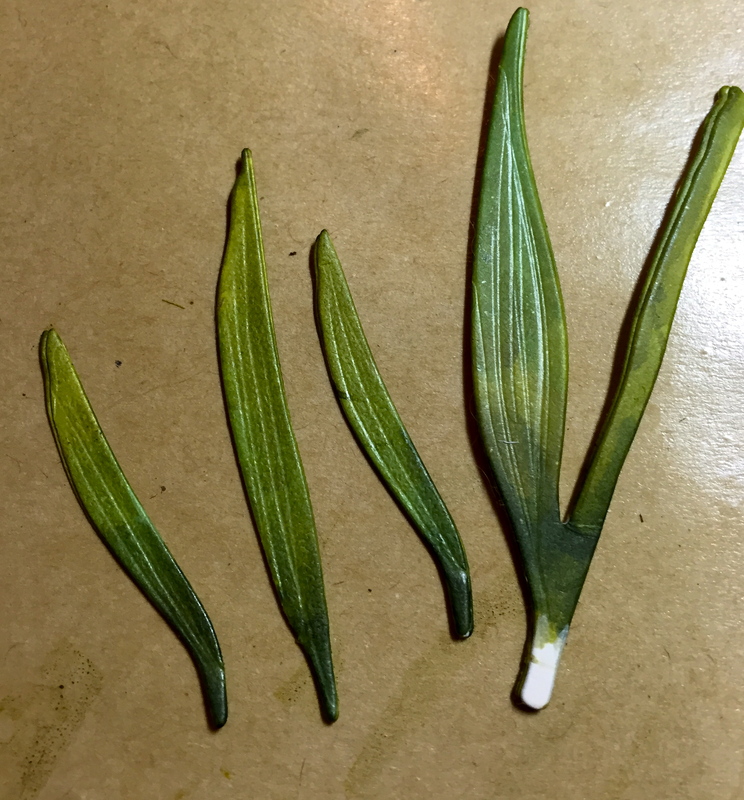 Add leaves to the flower. 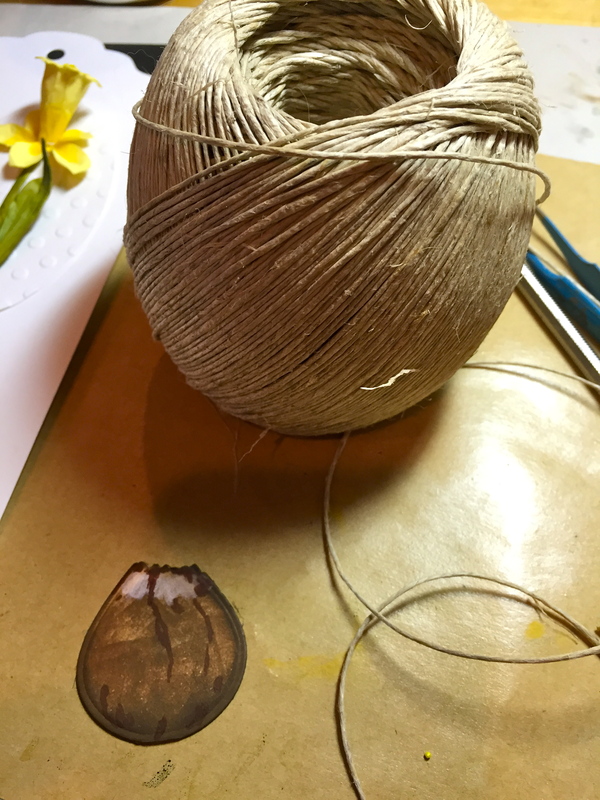 The roots were created with ordinary twine I found at a craft store. Cut a six to eight pieces ranging in length from 2-inches to 1-inch. 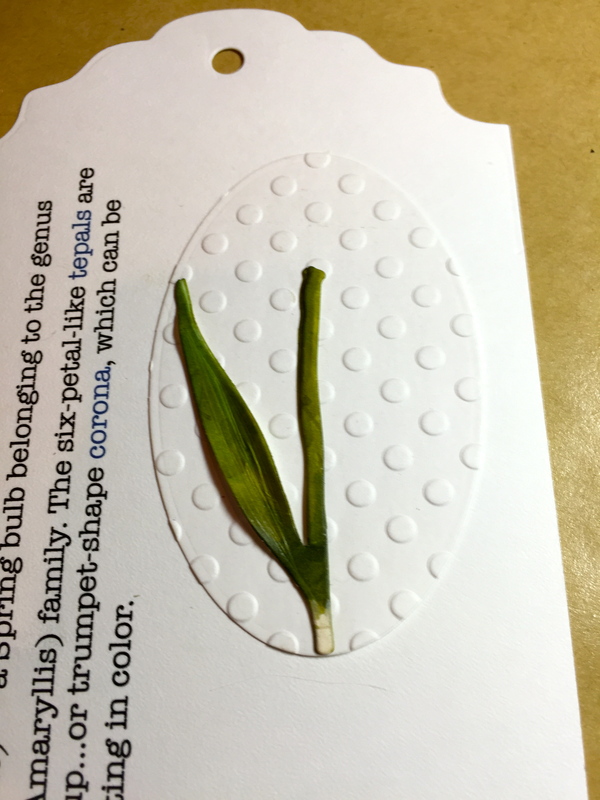 Peel the Clear Double Sided Adhesive from the back of the bulb and set roots in place. Add a ribbon to the tag and you’re done! 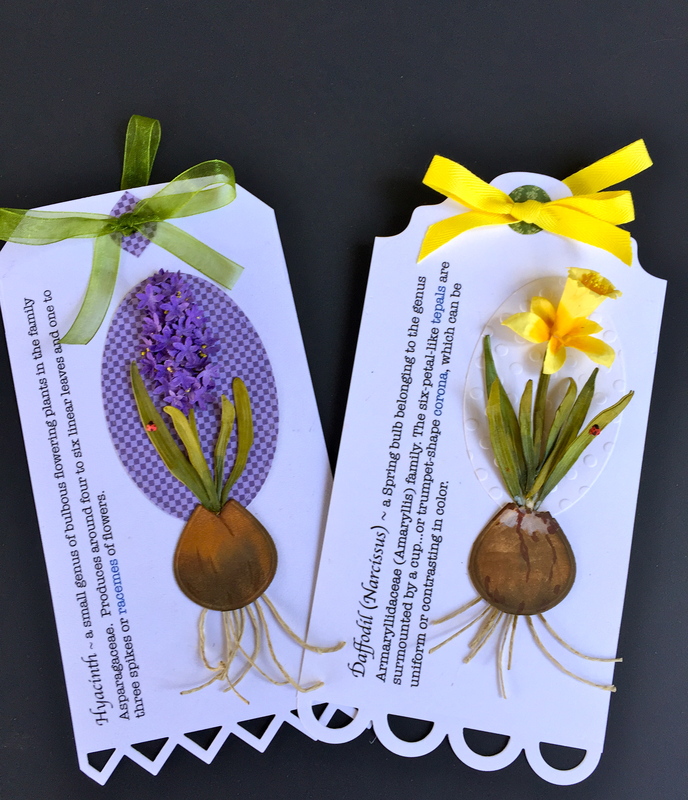 Spring is coming and giving the gift of flowers, whether it’s Daffodils or a sweet smelling Hyacinths, is something that will be greatly appreciated with this unique tag attached. Simply beautiful and extremely natural in appearance! These are fabulous, Susan! Thanks for the awesome tutorial. THis is stunning. How did you make the little ladybugs?